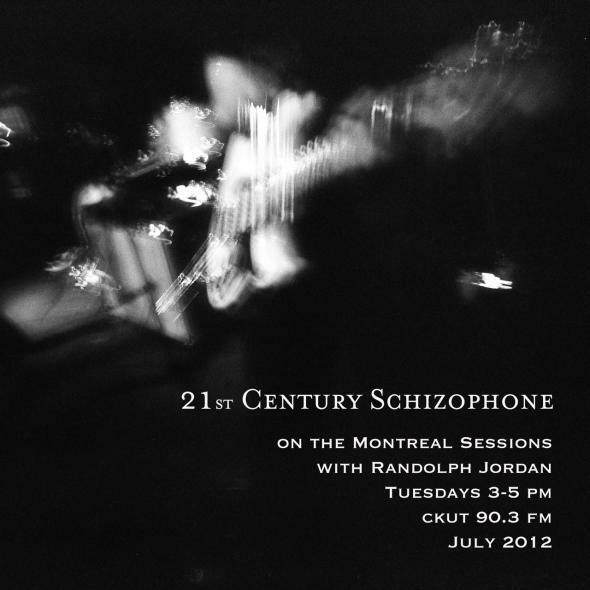 This July on The Montreal Sessions join film and soundscape chef Randolph Jordan for the 21st Century Schizophone, an eclectic meditation on the weird and wonderful consequences of the electroacoustical transmission of sound. The show takes its cue from R. Murray Schafer’s concept of “schizophonia,” referring to the various disorientations found within auditory environments increasingly saturated with technologies of sound reproduction, and will present a wide array of material that critiques, comments upon and celebrates the interventions of sound technologies in our daily lives. Tune in and you will hear soundscape compositions, film sound collages, epic psychedelic remixes, basement ballyhoo and some chatter featuring the work of artists within the Soppy Bag Records collective and beyond. The first episode featured Gerstyn Hayward’s A Family Thing, an hour-long piece of composite radio theatre drawing material from film melodrama, science-fiction, noir, horror and many points in between, arranged as a rumination on the medium of radio while exploring the theme of absence in families that have been disrupted by the departure of a single member. This week’s show will feature an in-depth listen to the work of sound designer Leslie Shatz and composers Hildegard Westerkamp and Frances White in and around the films of Gus Van Sant. We continue the show’s schizophonic mandate by considering what happens when soundscape composition is imported into the audiovisual realm of the cinema, and how film sound can become a sound art in its own right through the magic of radio. Tune in Tuesday, July 10th from 3-5pm or check out the show archives after the fact!